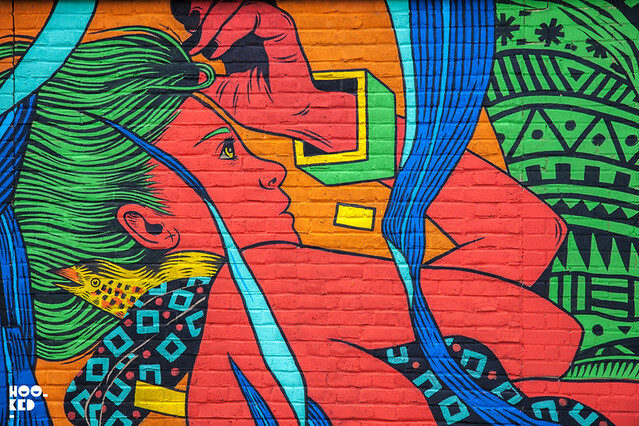 JustKids are set to host a pop-up exhibition in London showcasing the artworks of internationally famed Brazilian duo of artists Bicicleta Sem Freio ("Bicycle Without Brake"). Curated by Charlotte Dutoit from JUSTKIDS, the ephemeral exhibition will be open to visitors from the 5th through the 8th of March. "Bicicleta Sem Freio aka Douglas de Castro and Renato Perreira are preparing for their first ever solo show in London, where they will translate their signature style of highly expressive line work and vibrant color palette writing into fine art works with confidence. “FERA”, translates from Portuguese to mean wild or savage, intends to present on canvas and paper their unexpected juxtaposition of imaginary, rock’n’roll and often provocative subjects." 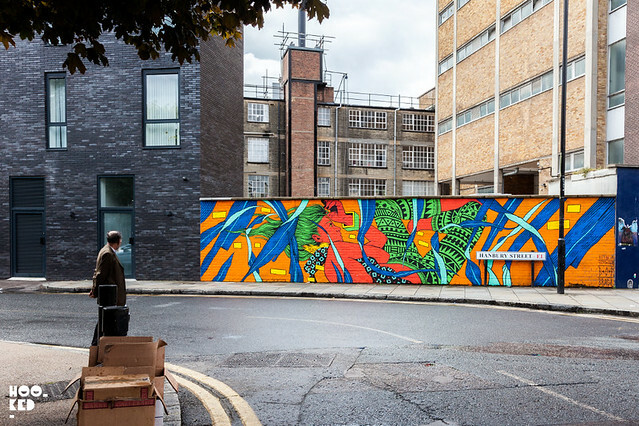 We were first introduced to the work of Bicicleta Sem Freio when the artists traveled to London in August of last year painting two murals in East London, both of which are still to be seen in city. The work pictured here was painted on Hanbury Street just off Brick Lane with a second mural on Pedley street also just off Brick Lane. We caught up with the artists at work on these murals and you can check our coverage here. The exhibition opens on the 5th March 2015 with a private view, 6-9pm. Opens to the public March 6th - 8th, 2015 12p.m. to 6p.m.